Frame work of bed is made of Rectangular Tube. 4 Section top made of CRCA sheet perforated Sheet. ABS moulded Head and Foot panel . Bed is mounted on 100mm Dia Castor 2 with brakes. Holder for Urine bag. SS telescopic I.V Rod with four location. Balkan Frame with bars and chains. Pulley attachment (without weight chain and weight hangers). Backrest & Kneerest elevation positions obtained by Smooth Crank System with foldable handles. 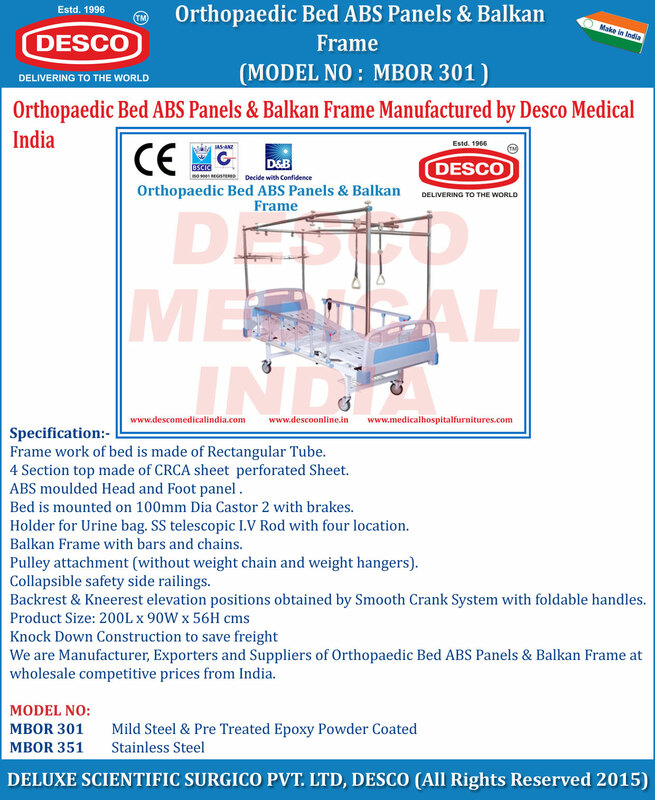 We are Manufacturer, Exporters and Suppliers of Orthopaedic Bed ABS Panels & Balkan Frame at wholesale competitive prices from India. MBOR 301 Mild Steel & Pre Treated Epoxy Powder Coated.